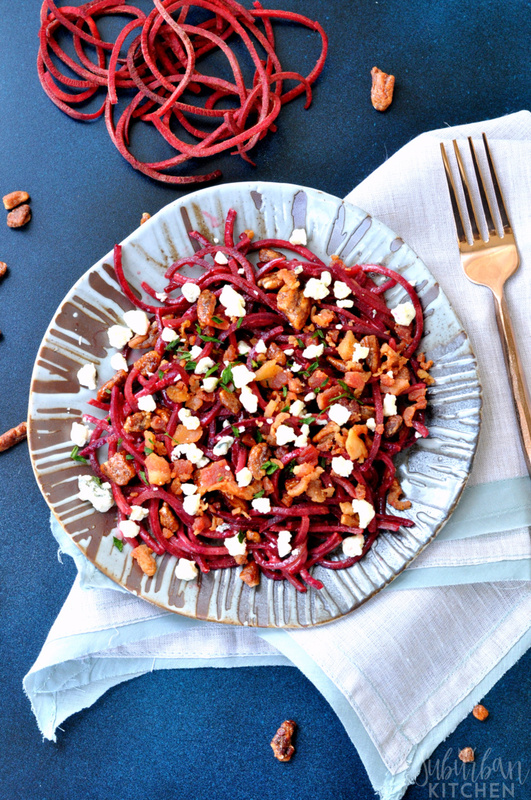 This honey mustard beet noodle salad is so easy to put together. 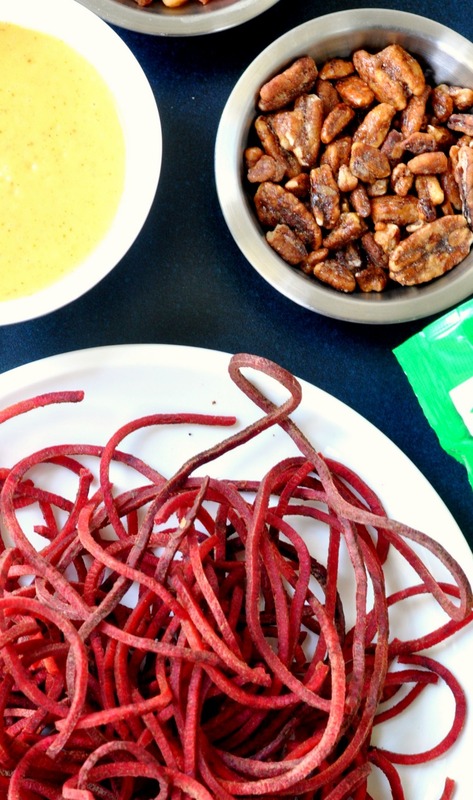 You can use pre-cut spiralized beet noodles or make your own using your spiralizer. 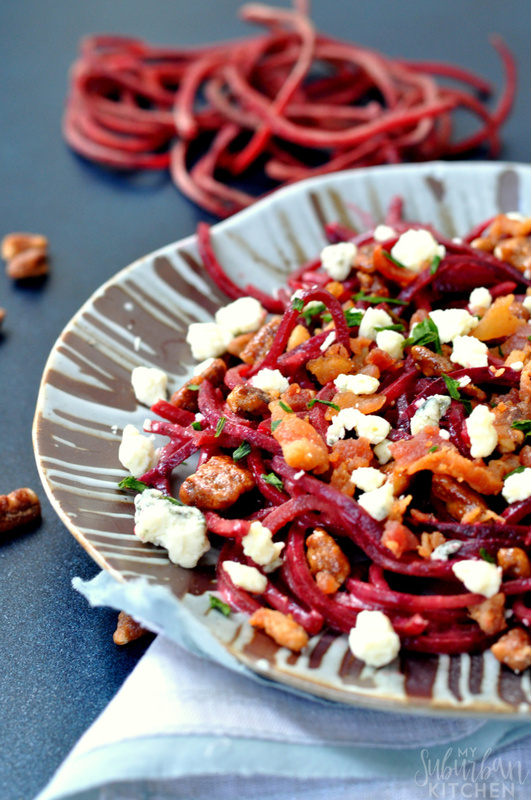 The beet noodles get tossed with a yummy honey mustard dressing. Crumbled goat cheese, bacon and glazed pecans round out the toppings. It is great warm, room temperature or chilled making it the most versatile side dish ever! If you make this honey mustard beet noodle salad ahead of time, keep the bacon and nuts off until you are ready to serve. That way, they don’t get soggy from the dressing. If you aren’t a big fan of goat cheese, you can definitely substitute a crumbled blue cheese or feta in this salad. I actually prefer it with crumbled blue cheese but no one else in my family will eat it that way. So, we go with goat cheese and every one is happy! 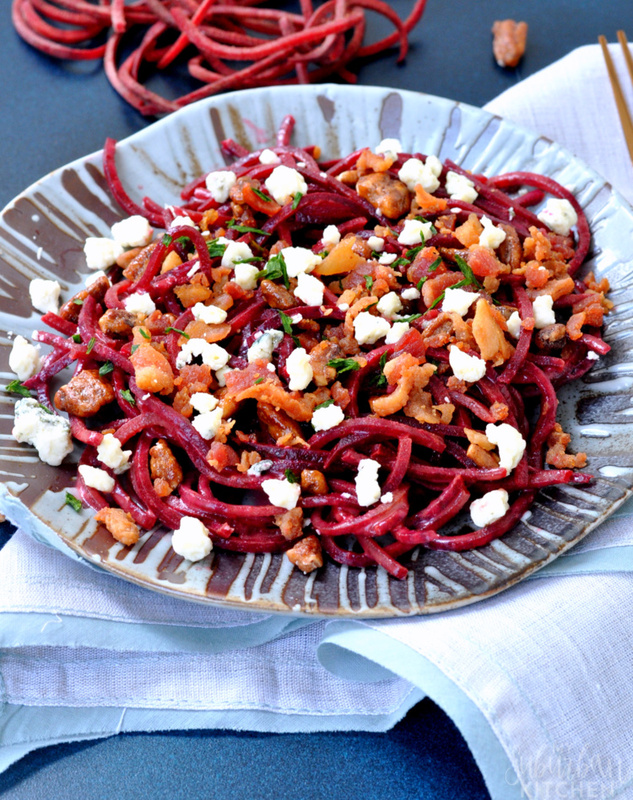 If you are a beet noodle fan, be sure to try my beet noodles with blue cheese sauce. They are divine! 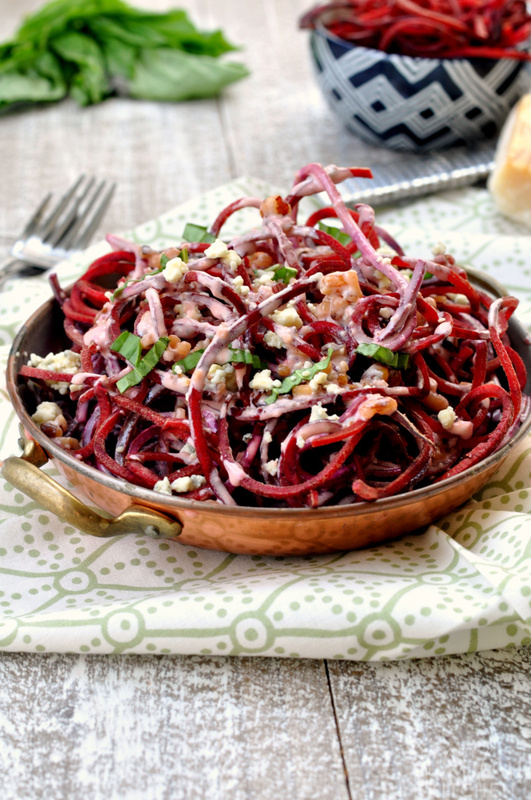 If you make this honey mustard beet noodle salad or any other recipe from the blog, I’d love to hear about it. Let me know in the comments or snap a photo and tag it #MySuburbanKitchen on Instagram or Twitter. 1. In a small bowl, whisk together olive oil, Dijon mustard, honey and white wine vinegar until well mixed. Set aside. 2. Heat oil in skillet over medium heat. Add beet noodles and cook, tossing frequently, for 2-3 minutes or until lightly softened. Stir in 1/4 cup of honey mustard dressing and cook for an additional minute. Remove from heat. 3. Top salad with goat cheese, pecans and bacon. Serve warm, room temperature or chilled. Crumbled blue cheese makes a great substitute for the goat cheese. I love the way this looks! Looks like such a delicious salad. Can’t wait to make this at home. The honey mustard really sounds like it would make a great dressing. Thanks for sharing!